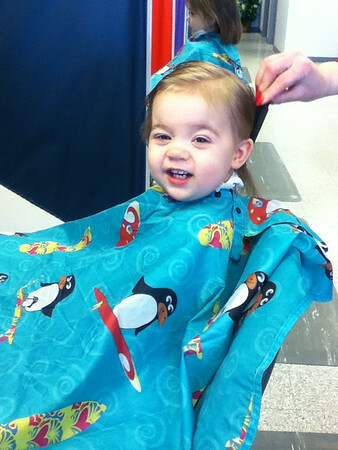 Today I took June to get her first haircut. Jacey was so excited and wanted her hair cut too so she could “show June how to sit really really still.” Jacey got bangs and about an inch trimmed off. She loves her bangs especially that her hair stays out of her face. 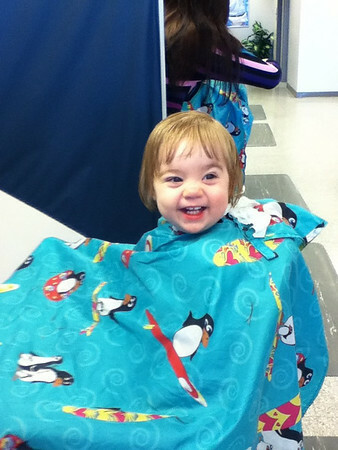 We went to Great Clips and were the only people there, so both girls got their hair cut at the same time. June sat so very nice and still. Every now and then she would look for Jacey to see what she was doing, and then she would look at herself in the mirror and smile. She did such a good job! The nice ladies there gave them each a sticker and a little certificate with a lock of June’s hair from her first haircut!